If someone came up to you tomorrow and said, “Its ok to kill someone, its not against the law!” Would you believe them? Would you kill someone? Probably not! How about if someone said that you could steal anything you wanted, or take your neighbour’s wife for you own, or you could lie about anything, would you go wild and do all of those things? I doubt it. 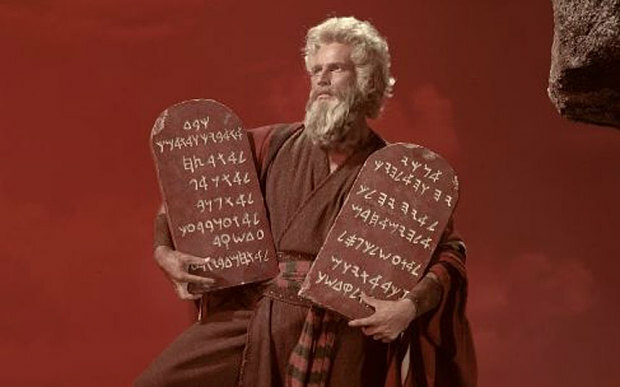 These are all forbidden to do in by man’s laws, but also forbidden by God’s laws under the Ten Commandments given to Moses in Exodus 20:1-17. 1 – Have no other Gods before me. 2- Do not create false idols. 3 – Do not take the Lord’s name in vain. 4 – Remember the Sabbath Day and keep it holy. 5 – Honour thy father and mother. 6 – Thou shall not kill. 8 – Thou shall not steal. 9 – Thou shall not bear false witness. 10 – Thou shall not covert thy neighbour’s goods. Those all seem pretty reasonable to me and very easy to follow. But look closely at #4 again: Remember the Sabbath Day and keep it holy. What does it actually mean, and are you breaking that commandment? So lets find out first, what does Sabbath mean? Sabbath: Old English sabat “Saturday as a day of rest,” as observed by the Jews, from Latin sabbatum, from Greek sabbaton, from Hebrew shabbath, properly “day of rest,” from shabath “he rested.” Spelling with -th attested from late 14c., not widespread until 16c. So by definition, the Sabbath is Saturday (or the seventh day of the week). It makes perfect sense that after a long week of work you would want a day of rest. It really doesn’t make sense that you’d have a day of rest at the beginning of your week, on the first day (Sunday). But for some reason most Christian denominations choose Sunday as their day of rest, or do they? (I’ll get to that in a bit). Many people argue that the Sabbath was moved from Saturday to Sunday when Jesus died on the cross and was resurrected. By definition, however, Sabbath comes from a word that means Saturday so you cannot just move the day without changing the definition! But maybe that is just being picky. Maybe God changed the day after His Son came to earth to live amongst us? Lets look at that. Revelation 22:13 – I am the Alpha and Omega, the beginning and the end, the first and the last. So God was here at the beginning, and everything will pass away except His words, and He never changes! So if He never changes, then the Sabbath Day that was put in place in Genesis 2:2 MUST still be in place today! So why do people attend church on Sunday? Interesting question, in fact there is NO biblical support of Sunday worship. All mention of worship in the Bible, even after Christ’s death and resurrection occurs on Saturday (the Sabbath). Sunday keeping began when Emperor Constantine made a declaration enforcing Sunday worship in 321AD. The law was confirmed by the Papacy in 364AD. The Sunday law is man-made and does not contain any spiritual or Biblical reference. The Papacy (or the Pope) confirmed this law in 364AD and therefore Catholic churches adopted and follow the Sunday law, but this is a law instituted by a man and not by God, and therefore is completely and totally in contradiction to God’s law as told in Exodus! And since I have already shown to you that God never changes, then His law cannot change also! But if you choose to follow Sunday as your Sabbath, both incorrectly in law and by definition, do you keep it holy? I’d say that most Sunday-keeping Christians do not! You have to read the whole of the passage that describes the fourth commandment to get the full meaning and scope of what is required. Exodus 20:8-11 states: Remember the Sabbath day and keep it holy. Six days shalt thou labour, and do all thy work; But the seventh day is the sabbath of the Lord thy God; in it thou shalt not do any work, thou, nor thy son, nor thy daughter, thy manservant, nor thy maidservant, not thy cattle, nor thy stranger that is within thy gates; For in six days thee Lord made heaven and earth, the sea, and all that is in them is, and rested the seventh day; wherefore the Lord blessed the sabbath day, and hallowed it. Seems a little wordy, but it is needed! God told us to rest on the sabbath day and do no work, what do you do on Sunday? Do you cut the grass, do laundry, clean, paint the house, do yardwork, or even go to a regular job? If you do any of this work on Sunday, your day of rest, then you have broken God’s law. So lets go back to the beginning, where we all agreed (hopefully) that it was against God’s law to kill, steal, covert, etc, and therefore it is against God’s law to work on the Sabbath Day. If you break ONE of God’s commandments, you have broken them all! Jesus tells us in John 14:15 “If you love me, keep my commandments.” He doesn’t say to keep the commandments that are convenient, He says to keep His commandments! I’ve chosen to be a Seventh Day Adventist and follow the law including the fourth commandment. And finally before I close this posting, there may be some of you questioning the commandments as presented here. If you were raised Catholic, you may have seen a different version. The Catholic Church has removed the original second commandment which forbids graven images, or idols and then moved the Sabbath commandment to number three. The Catholic Church then takes the tenth commandment about coveting your neighbour’s wife and goods, and splits it into two parts, so that the full ten commandments remain. If you visit any Catholic Church around the world, you will find statues and idols of all kinds to be bowed down and worshipped to. This would be in full contradiction to the original second commandment, so the church removed it! Man cannot change God’s laws to make them convenient! Next Where Is Your Church?